Guam (/ˈɡwɑːm/ (listen); Chamorro: Guåhån [ˈɡʷɑhɑn]) is an unincorporated and organized territory of the United States in Micronesia in the western Pacific Ocean. It is the easternmost point and territory of the United States, along with the Northern Mariana Islands. The capital city of Guam is Hagåtña and the most populous city is Dededo. The inhabitants of Guam are called Guamanians, and they are American citizens by birth. 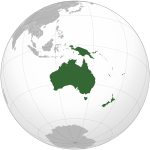 Indigenous Guamanians are the Chamorros, who are related to other Austronesian natives of Eastern Indonesia, the Philippines, and Taiwan. Guam has been a member of the Pacific Community since 1983. The national team plays at the Guam National Football Stadium and are known as the "matao" team. Matao is the definition of highest level or "noble" class; the matao team have done exceptionally well under the head coach Gary White. As of 2016, the Matao is led by Darren Sawatzky, the current head coach. The top football division in Guam is the Guam Men's Soccer League. Rovers FC and Guam Shipyard are the league's most competitive and successful clubs, both have won nine championships in the past years. The Guam national basketball team is traditionally one of the top teams in the Oceania region behind the Australia men's national basketball team and the New Zealand national basketball team. As of 2015, it is the reigning champion of the Pacific Games Basketball Tournament. Guam is home to various basketball organizations, including the Guam Basketball Association. Andersen Air Force Base (Andersen AFB, AAFB) (IATA: UAM, ICAO: PGUA, FAA LID: UAM) is a United States Air Force base located approximately 4 miles (6.4 km) northeast of Yigo near Agafo Gumas in the United States territory of Guam. Along with Naval Base Guam, Andersen AFB was placed under the command of Joint Region Marianas on 1 October 2009. The two bases are about 30 miles apart at opposite ends of the island. Administration offices for Joint Region Marianas are about half-way in between, at Nimitz Hill.The host unit at Andersen AFB is the 36th Wing (36 WG), assigned to the Pacific Air Forces Eleventh Air Force. A non-flying wing, the 36 WG's mission is to provide support to deployed air and space forces of USAF and foreign air forces to Andersen, and to support tenant units assigned to the base. Andersen AFB was established in 1944 as North Field and is named for Brigadier General James Roy Andersen (1904–1945). The 36th Wing Commander is Brig. Gen. Gentry W. Boswell. The Vice Wing Commander is Colonel Matthew J. Nicholson and the Command Chief Master Sergeant is Chief Master Sergeant Gary R. Szekely.The most important U.S. air base west of Hawaii, Andersen is the only one in the Western Pacific that can permanently base U.S. heavy strategic bombers (one of the four Air Force Bomber Forward Operating Locations), including B-1B, B-2, and B-52 bombers. It is one of two critical US bases in the Asia Pacific region, along with Diego Garcia in the Indian Ocean. Guam's at-large congressional district comprises the entire area of the United States territory of Guam. Guam has been represented in the United States House of Representatives by a non-voting delegate since 1972. It is currently represented by Democrat Michael San Nicolas who has represented the district since 2019. As territorial militia units, the units in the Guam Air National Guard are not in the normal United States Air Force chain of command. They are under the jurisdiction of the Governor of Guam though the office of the Guam Adjutant General unless they are federalized by order of the President of the United States. The Guam Air National Guard is headquartered at Andersen Air Force Base, and its commander is Colonel Botha. Hagåtña (; Chamorro pronunciation: [hæˈɡɑtɲæ], formerly in English: Agana and in Spanish: Agaña) is the capital village of the United States territory of Guam. From the 18th through mid-20th century, it was Guam's population center, but today it is the second smallest of the island's 19 villages in both area and population. However, it remains one of the island's major commercial districts in addition to being the seat of government. The Governor of Guam (Chamorro: I Maga'låhen/Maga'håga Guåhan ) is the chief executive of the Government of Guam and the commander-in-chief of the Guam National Guard, whose responsibilities also include making the annual State of the Island (formerly the State of the Territory) addresses to the Guam Legislature, submitting the budget, and ensuring that Guam's public laws are enforced. The position was created in 1968, through the passage of the Guam Elected Governors Act which took effect in 1970. Guam elected its first civilian governor in 1970 with the inauguration of former governor Carlos Camacho. This is a list of bridges and tunnels on the National Register of Historic Places in the U.S. territory of Guam. Michael Franklin Quitugua "Mike" San Nicolas (born January 30, 1981) is a Guamanian politician, currently serving as the Delegate to the U.S. House of Representatives for Guam's at-large congressional district. A member of the Democratic Party, San Nicolas previously served as a senator in the 32nd, 33rd, and 34th Guam Legislatures. He also served as chairman of the Committee on General Government Operations and Federal, Foreign, & Regional Affairs. San Nicolas defeated eight-term incumbent Madeleine Bordallo in the August Democratic primary, and then won the general election.